Spring Break is just days away and I cannot wait! Like I've mentioned before, I'm going to California with my boyfriend and I am pumped. We don't have an exact plan for what we'll be doing yet, but it will be nice to just have a break and get out of Clemson for a week. Hopefully one day next week we will be headed to the Los Angeles area and the beach. So today I am bringing you some spring break essentials for your beach days since that seems to be how most college students spend their break. sunscreen // If you are going to be spending all day on the beach, you need a good sunscreen. Do not be one of those people who doesn't use sunscreen because you want to get a tan. You will end up a lobster by the end of the week. If nothing else, make sure to have sunscreen on your face because that skin is so thin and more susceptible to burns. The sunscreen I use all summer long is the Neutrogena Ultra Sheer Dry Touch Sunscreen. I tend to use the 75 or 100+ spf. They have a range of spfs so you aren't limited to the versions designed for those of us who burn the second we get in the sun. fun towel // It's a good idea to have a very recognizable towel when you go to the beach so that you can always find your spot amongst the sea of spring breakers. 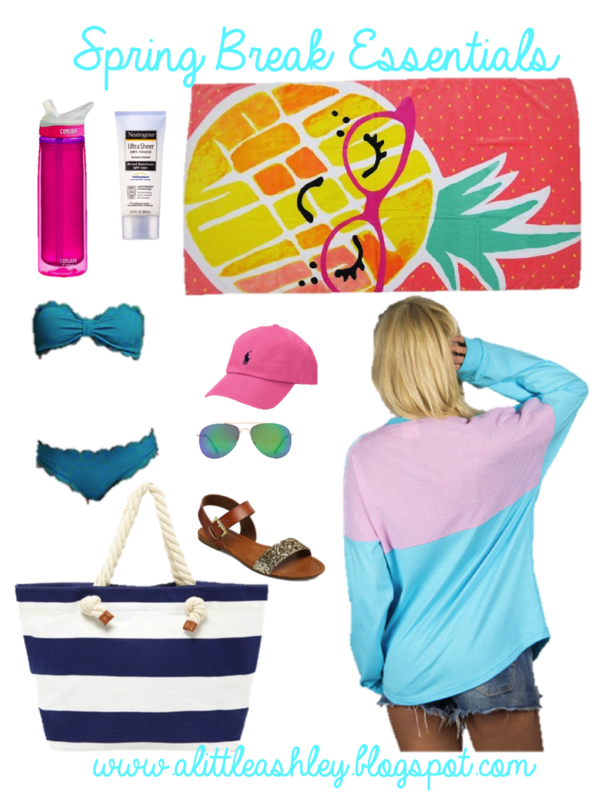 How cute is this pineapple towel?! I know it is probably meant for little kids, but I think it is adorable. cute bikini // would spring break be complete without the perfect bathing suit. This bikini from Old Navy is perfectly on trend with the scallops, and if you're not a fan of bandeaus it comes with detachable straps. hat // I bought this pink Ralph Lauren polo cap before coming to college and I have gotten so much use out of it. You can bet it will be in my suitcase next week. It helps keep extra sun off your face and easily hides messy beach hair. cheap sunglasses // One of the last things you want to do on spring break is bring your nice expensive sunglasses. Find a cute cheap pair, that you don't care if they somehow get stepped on or forgotten on the beach. This pair is only $3 but they have the same look as expensive mirrored Ray Bans. sandals // Personally I don't like wearing just plain old flip flops. Cute sandals like these can easily go from the beach to dinner with your friends. I have wanted this pair from Target for a few years now, and this spring I might finally have to get them. The glitter strap just adds a little something extra and fun. coverup // Since it is still early spring, the beach has the possibility of being a little chilly, especially in the evening. Lauren James' interpretation of a spirit jersey is the perfect top to throw on over your swimsuit. I bought this exact beachcomber over the summer during the Lauren James pink Friday sale, and I have worn it so much. It is super soft, and the seersucker panel on the back is adorable. I am a huge fan of the Lauren James, because they have amazing customer service in addition to really cute clothes. Check out all their perfect spring pieces. beach bag // Last but not least, you need a bag to haul all of your stuff to and from the beach. I love the rope handle on this bag and the price is extremely reasonable! Have a wonderful spring break!! !